The Christophe Claret Only Watch 2015, which pays tribute to hope and peace, features an extraordinary dial centrepiece which relegates the indication of time to a secondary position. 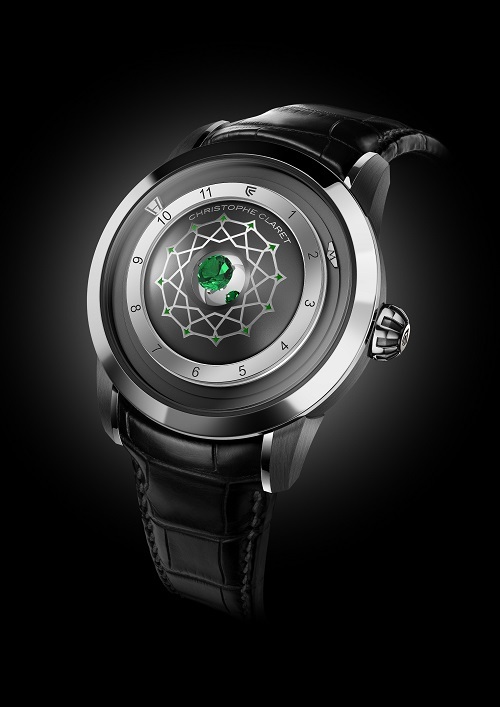 The emerald which takes up the central position of M. Claret's unique and aptly titled "Espoir & Paix" is magnified by a mirascope so that it looks much larger than its true size and appears to elevate proudly. It is such a dominant feature that in order to accommodate it the hours and minutes have been positioned on the periphery just inside the bezel. "Hope" is signified by the striking green hue of the emerald and "Peace" is represented on the caseback to superb effect where a portrait of Alfred Nobel in miniature is surrounded by the names of all 129 Nobel Prize recipients. Inside the piece is the AVE15 self-winding Calibre and the case is white gold and grey PVD titanium, measuring 44mm across. More details at the Christophe Claret website here.